The Pacific is a world of tsunamis and Magellan, of the Bounty mutiny and the Boeing Company. It is the stuff of the towering Captain Cook and his wide-ranging network of exploring voyages, Robert Louis Stevenson and Admiral Halsey. It is the place of Paul Gauguin and the explosion of the largest-ever American atomic bomb, on Bikini atoll, in 1951. It has an astonishing recent past, an uncertain present and a hugely important future. The ocean and its peoples are the new lifeblood, fizz and thrill of America - which draws so many of its minds and so much of its manners from the sea - while the inexorable rise of the ancient center of the world, China, is a fixating fascination. The presence of rogue states - North Korea most notoriously today - suggest that the focus of the responsible world is shifting away from the conventional post-war obsessions with Europe and the Middle East, and towards a new set of urgencies. 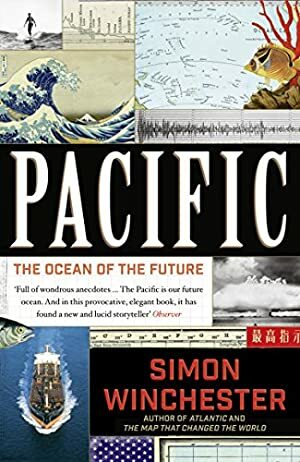 Navigating the newly evolving patterns of commerce and trade, the world's most violent weather and the fascinating histories, problems and potentials of the many Pacific states, Simon Winchester's thrilling journey is a grand depiction of the future ocean. Log In to track Simon Winchester on eReaderIQ. to be notified each time the price drops on any book by Simon Winchester. to stop tracking Simon Winchester. We started tracking this book on April 1, 2015. This book was £19.59 when we started tracking it. The price of this book has changed 31 times in the past 1,485 days. The current price of this book is £4.99 last checked 5 hours ago. The lowest price to date was £1.99 last reached on August 1, 2018. The highest price to date was £19.59 last reached on April 1, 2015. This book has been £19.59 one time since we started tracking it. We last verified the price of this book about 5 hours ago. At that time, the price was £4.99. This price is subject to change. The price displayed on the Amazon.co.uk website at the time of purchase is the price you will pay for this book. Please confirm the price before making any purchases.